Rigid Industries LED Lighting is the world leader in cutting edge off-road LED lights, marine LED spreader light bars, UTV LED bars, OE specific LED Lights, Grilles, and Mounting options, Public Safety Scene Lighting, Agricultural Lighting, Industrial strength LED Lights, and any other Commercial Fleet Truck LED Lighting Options. The Rigid LED Light is considered the highest quality and the king of LED Lights. Purchase the name you trust and the quality that backs up that name! QUALITY POLICY – It is Rigid Industries commitment to comply with requirements and to continually improve the effectiveness of the quality management system. Our primary goal is to design and manufacture the best forward projecting and auxiliary LED lighting products in the world. Continue to lead the LED revolution with optical technology, unsurpassed quality and leading edge innovation defining the future of LED lighting while providing excellence in customer service. The team at Rigid Industries is united in the belief that both quality and reliability are built into the products by employees who are trained, disciplined, and who are active participants in the company’s success. Industries, such as Commercial Construction, require more from their lighting products than light duty applications. That’s why Rigid Industries LED Lighting has developed specific lighting components for these industrial applications. These HD lights feature larger, stronger mounts with vibration isolators for a durable, long-lasting product that can withstand harsh elements. The Mining industry requires a light that’s not only going get the job done but also rugged enough to get the job done right. Why settle for anything less? Rigid Industries LED Lighting has developed specific lighting components for these industrial applications. These HD lights feature larger, stronger, mounts with vibration isolators for a durable, long lasting product that can withstand any harsh element. Whether you’re in a tractor / trailer on a cross-country haul or a service vehicle on a local delivery, safety is your number one concern. Lighting components from Rigid Industries LED Lighting are built to withstand the harshest of elements while providing industry leading light output. Significantly improved visibility translates to increased safety and productivity. The agricultural industry doesn’t quit when the sun goes down. Increase productivity by increasing visibility at night. 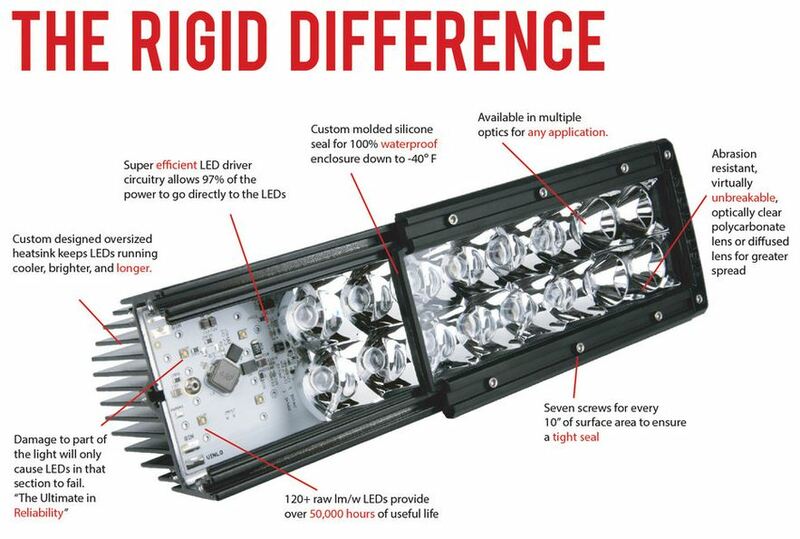 Rigid Industries LED Lighting offers standard and Heavy Duty lighting components that are designed to stand up to the demands of today’s agricultural needs. Rigid Industries LED Lighting is the manufacturer of choice for many automotive / off-road racing teams as well as weekend warriors, due to the quality and industry leading light output. Whether you drive a trophy truck, a quad, a UTV, or a sandrail, Rigid Industries LED Lighting has the lighting components, mounts, and accessories to keep you safe and give you the best visibility available. We take the safety of the men and women that serve our country very seriously. Rigid Industries’ LED industry leading lighting components are designed to provide extremely high output, draw very little power, and withstand the harshest of environments.